What happened to Greg on the day he was arrested can happen to anyone. “Sometimes,” Campbell law professor Anthony Baker told us, “you don’t pick the project, the project picks you.” That is exactly the way we feel about this project. In the fall of 2009 we were hired to create a profile of Chris Mumma, the Executive Director of the North Carolina Center on Actual Innocence. 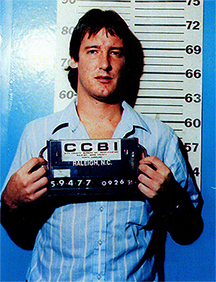 Chris had been instrumental in reforming many of the procedures used by North Carolina’s police and prosecutors to help insure fewer wrongful convictions, had helped craft legislation forming the new North Carolina Innocence Inquiry Commission, and had successfully freed Dwayne Dail, a wrongfully incarcerated prisoner who had spent 19 years in prison. For this work Chris had won the Z. Smith Reynold’s Foundation’s Nancy Susan Reynolds Award for Advocacy. The video we made of her was shown at the awards luncheon. Watch Video. During her acceptance speech Chris told the audience to pay attention to the news because something exceptional was going to happen in the North Carolina Courts. Two weeks later Chris asked if we wanted to document Greg Taylor’s care. Greg was convicted of murdering Jacquetta Thomas in 1993. For thirteen years his family had done everything they could to gain his freedom. By 2006 they were out of options. Then, fortuitously, Greg’s written copy of the details of his case found its way into Chris’ hands. As the director of the North Carolina Center on Actual Innocence (NCCAI), Chris sees hundreds of innocence claims a year. She evaluated Greg’s case and agreed to take it on. But after three years of work, and limited by appellate laws, she realized that she would be unable to find the evidence she needed to gain Greg his freedom. So, she referred the case to the North Carolina Innocence Inquiry Commission. Chris knew the NCIIC well, while she had been the law clerk for Chief Justice I. Beverly Lake, Jr., she had helped to write the legislation that created the agency. The NCIIC is an independent, state-supported agency specifically created to examine post-conviction claims of innocence. The NCIIC’ s unique process allows ALL case evidence and records to be examined. It has fulltime investigative staff and has subpoena power; college Innocence Projects and organizations like Chris’, lack both. The NCIIC was, and still is, unique in the US. By November of 2009, Greg’s case had been through the first two stages of the NCIIC process – the investigation had been completed and presented to the agency’s Commissioners. During a two day hearing in September, the commissioners heard the evidence and voted, unanimously, to send Greg’s case to the final step of the NCIIC process, a hearing before three judges. It was at this point that Chris called and asked if we’d be interested in documenting Greg’s case. While it was possible Greg could be the first person released through this process it was every bit as likely that the judges would refuse to release him and would send him back to prison. Of course, we jumped at the chance. What followed was two months of dropping everything whenever the phone rang, getting in the car and driving from Winston-Salem to Raleigh to record an interview or cover an event. If we needed something to inspire us to keep going we got it on the afternoon of February 17, 2010 when the three judges all ruled that Greg was innocent of the murder of Jacquetta Thomas. The years that followed have been filled with lessons in perseverance, patience, and understanding. As, we suspect, happens with all independent films, there are times you make great progress and times everything grinds to a halt. Things that you think would take a couple of weeks take four months. And often financial reality (and the day job) just hit you in the face and it’s time to earn some money. But six years later, we’ve shot all interviews and gathered lots of other footage, created an award winning short Greg Taylor – Ghost, and have a 110 minute rough cut detailing the case. We’ve hosted several “work in progress” screenings, we’ve been building audience, we have applied for a Fiscal Sponsor and have been accepted by the prestigious International Documentary Association’s Fiscal Sponsorship program. We’ve taken Greg Taylor – Ghost to 6 film festivals and received special recognition 3 times. And, last in this list, but certainly not least, we have been preparing to fund raise. Our $118,000 completion budget includes scoring, color correction, archival/stock footage and stills, this website, and marketing materials. Fundraising runs October 2016 – February 2017. Our goal is to premiere the film in February 2017 — the 7th anniversary of Greg Taylor’s release. Film festival submissions will run through 2017 – 2018. We’re committed to our project having real impact in 2017. This includes bringing the film to college campuses with Innocence Projects, to churches, civic and public policy organizations, and to state legislators to educate them on this critical reform process which can help the wrongfully convicted get justice. And, providentially, it seems that the mood in the nation is right for a conversation about criminal justice reform. With the exception of a couple of early supporters this work has been self-funded and self-motivated. Despite the delays, the hurdles, and the challenges there has never been a question about not telling this story. Perhaps Prof. Baker was correct when he says that sometimes the project chooses you.